A call to Edmiston & Company brings news that Mike Horsley has signed the famous 26.5m classic sailing yacht Royono for sale. Built by the famed Nathaniel Herreshoff in 1936, she was fully restored by Classic Works in La Ciotat during 2003, with teak and cedar on steel frames and an Awlgrip paint job in English racing green. 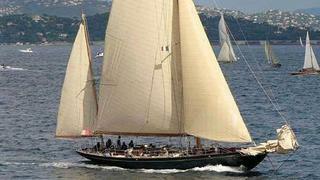 A Bermudan yawl-rigged yacht, she sleeps six guests in three cabins with accommodation for three crew. She is for sale including crockery, towels, bedsheets and mattresses - all unused. Royono is asking €3.5 million.